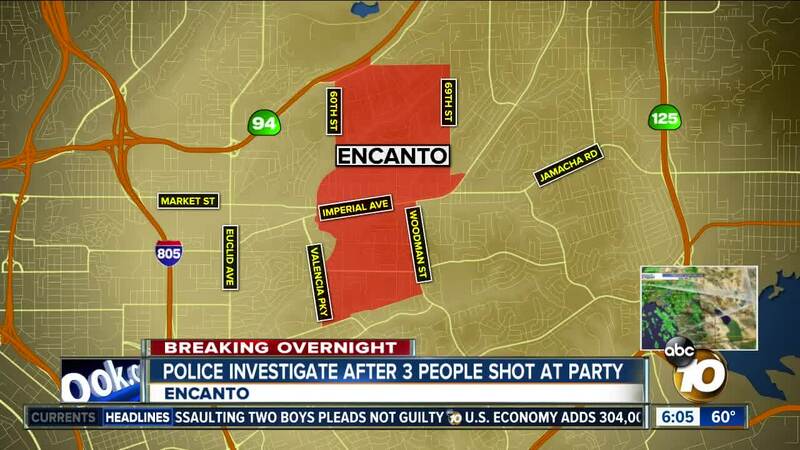 SAN DIEGO (KGTV) — San Diego Police are investigating a shooting that injured four people after a fight at an Encanto house party late Friday. Four people were shot just before 12 a.m. Saturday, according to police, after a fight at the house party in the 6800 block of Springfield Street. Three of those individuals suffered non-life threatening injuries. The fourth victim received life-threatening injuries and was in critical condition, according to police. The suspect of the shooting is described as a black male wearing dark clothing. No further description was available. Anyone with information is asked to call SDPD at 619-531-2000 or at 858-484-3154.